There are a few personal items that I find worth splurging on from time to time. If I had to pick the item I am particularly passionate about, it would be handbags. I liken my pursuit of the perfect handbag to a predator seeking its prey. I search, assess, wait, assess some more, consider if there is something better or more affordable out there, and then pounce. As anyone who knows me will tell you, I take my sweet time making a decision. Of course there are times when it’s love at first site, but more often than not, there is some due diligence involved with handbag acquisition. Tedious as that process may be, I am generally pretty happy with my selections. To be clear, not all of my handbags are financial splurges. A solid construction that has eye appeal without a lot of flash gets my vote. I love bags and change mine up quite a bit. What about you? I am of the age that when I was young and working, it was a big deal to carry a Kate Spade bag. Back then, when I had a little extra money in my pocket, I hustled myself over to Newbury Street to Kate’s namesake store here in Boston to pick out something for myself. My mother had given me the iconic black, nylon, structured Kate Spade bag that I carried for years, but this would be one of the first handbags I would pick out by myself, for myself. What was wonderful about entering the Kate Spade store was that it was full of color. It was like being in a candy store with so many fun shapes and styles to choose from among the shelves. The two bags that I purchased in that store lasted a very long time in my possession. One was a rectangular shaped, robin’s egg blue fabric bag that had a thin, black leather handle and a snap top. It was so cheerful to look at and carry around, the perfect size for a working girl who might need to carry a legal pad in it for meetings. The bag made me so happy and I carried it forever. The other bag I purchased from Kate’s earliest lines was a nice sized purple, canvas tote bag that had a ribbon tie at the top. It was so adorable and equally functional and fun to carry around. A white leather shoulder bag with a kelly green interior studded with gold polka dots followed. That was what I loved most about Kate Spade bags. They were well constructed yet fun, playful, and a great departure from the serious leather bags our mothers and grandmothers carried. I imagine they were just an extension of Kate’s personality. Many high and low handbags later, I was in New York with our younger daughter at a time when I was casually searching for the perfect neutral colored shoulder bag for the summer. We were in Bloomingdales and I spotted it, sitting pretty and waiting for me to come fetch it. I hadn’t purchased a Kate Spade bag in years at this point, but this neutral lovely sported the familiar label on the outside. It was like greeting an old friend who was reliable and always knew what you were thinking before you said it out loud. It’s in my closet and will be in my summer rotation. Lastly, I have a magnificent Kate Spade winter weight pink dress. I have absolutely no clue if this dress was made before or after she sold her iconic brand, but I do know that I wore it to the Pops and received a compliment from a woman here in Boston who is known for her fashion sense (funny the things you remember). It is classic Kate Spade in that “old world meets new world” style associated with the fashion label now owned by Coach. I will keep that dress forever now. And so, I was incredibly saddened to learn of Kate’s death this past week. It stopped me in my tracks to think of this woman, about my age, who chose to end her life. I wish I had something profound to say about this, but rather I am choosing to honor her by sharing with you how valuable her creations were in my life and how they marked a moment in time for me as I am sure they may have for many of you. I’m not sure this is completely related, but Kate’s death made me think of all the people, celebrities or otherwise, who we can sometimes hold to an impossible standard. Our sports teams or individual athletes, musicians or singers who always have that next hit song, authors who churn out book after book, spouses or children who have the winning formula for success. In any case, I decided to use my blog this week as a way to thank Kate Spade and to express my sadness while also wishing the designer and her family much peace. Switching gears, I have been in the kitchen cooking this week as I wanted to test run a recipe or two that I will be serving for lunch to a few friends. I have been eager to reestablish a relationship with the countless cookbooks that line my kitchen bookshelves and so I took out a few classics (Nantucket Open House Cookbook and The Silver Palette) for some inspiration. I need to make a point of cooking more recipes from these divine books because they are rich with wonderfully creative fare. But, I digress. I created a menu for this lunch by taking a page out of the book of a few spots here in our town that serve 3-salad plates. It’s a great way to have a few different tastes of this and that, and when you are serving a group, this strategy hopefully guarantees that everyone will find at least one or two things they enjoy! I had a few dishes in mind already and needed one more hearty salad, preferably gluten free for my guests. I settled on a very colorful Southwest Quinoa salad from the cookbook, Fresh From the Farm by Susie Middleton. I posted a recipe for Spicy Thai Shrimp and Baby Bok Choy Stir Fry from this cookbook after meeting Susie at the Wayland Farmer’s Market a few years ago. That’s a tasty dish if you haven’t tried it. In any case, I tested the recipe earlier in the week just to make sure it was as tasty as it looked and I thought it fit the bill. 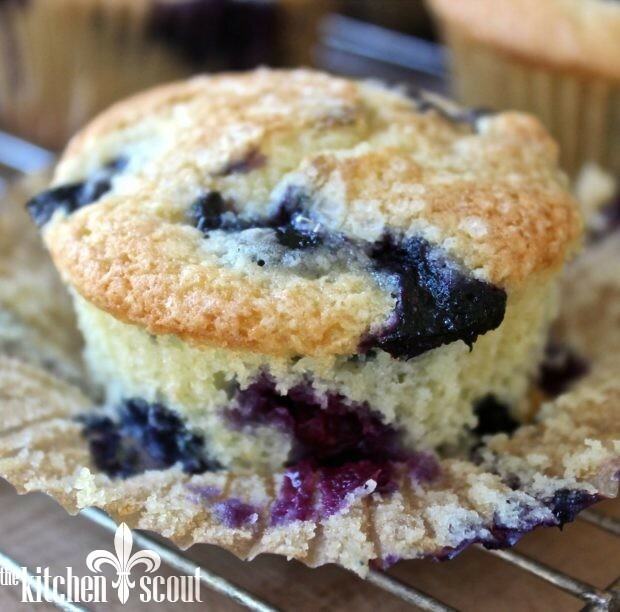 Since the recipe made quite a bit, I gave it away to a few friends who all gave it the thumbs up as well. I didn’t tweak the recipe that much in the end. Instead of using just red quinoa, I used a combination of red and white. You can use all red, all white or a multi-color. Susie finished her salad with toasted pine nuts which definitely pop because of their color, but I used pepitas which I thought was more in keeping with the Southwest theme. Otherwise, the salad is as I found it, filled with some warm spices like cumin, coriander and cinnamon, and studded with corn, black beans, red peppers and zucchini. Susie finishes hers with some garlic-chili sauce (1/4 teaspoon) and I swapped that out with just a chili sauce because there is garlic in the dish already. I honestly think you could leave it out and you would never notice. This dish keeps for a few days in the fridge and I think the flavors get better as it sits. It’s a great vegetarian dish but is perfect side dish fare for bbq’s, especially since there is no mayo or cheese to worry about sitting out. 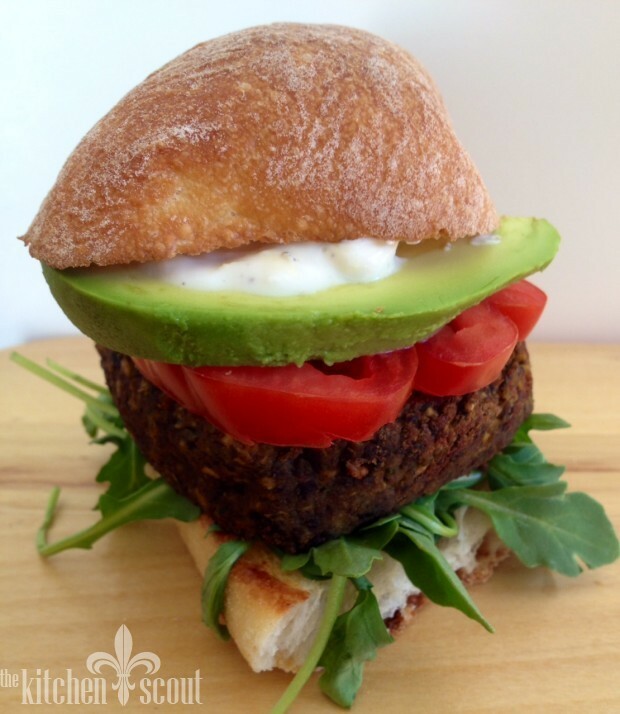 I hope you give the recipe a whirl in your kitchen sometime soon. If you do, please let me know if you like it! 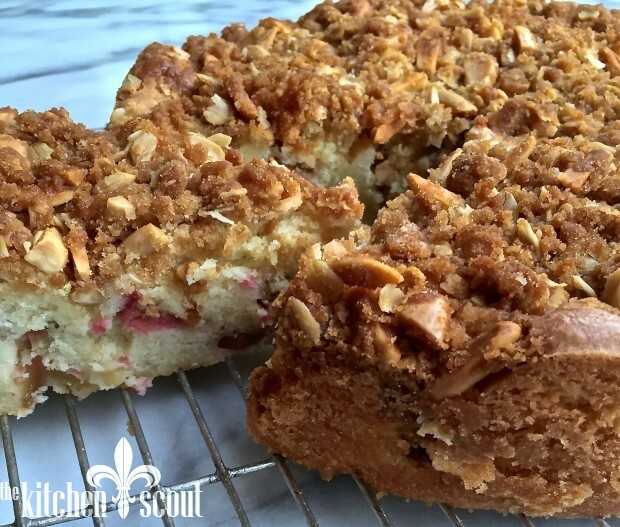 This recipe, ever so slightly adapted, is from Fresh From the Farm by Susie Middleton. 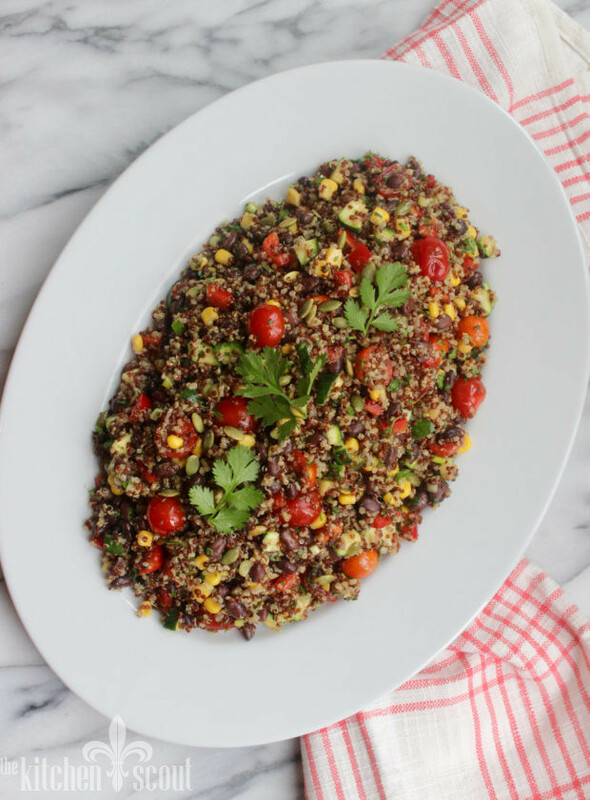 While the recipe calls for red quinoa, you can use white quinoa or a mix of colors, depending on your preference. 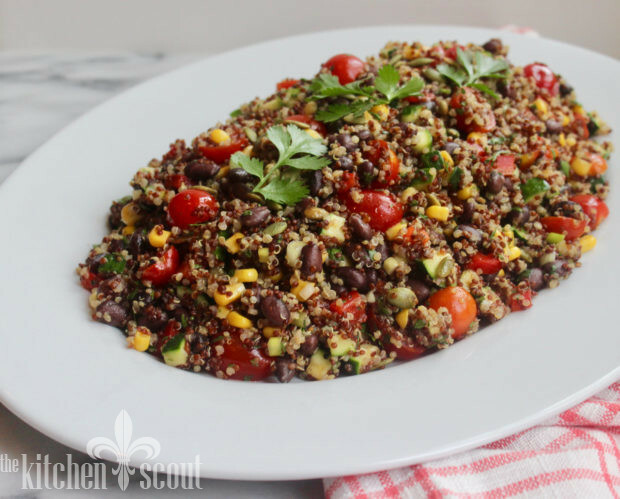 As Susie says in her notes, there is a salad within a salad in this recipe as the black beans and veggies can be tossed with the dressing on their own if you are not up for quinoa! The salad will keep for a few days in the fridge. Combine 1 teaspoon salt, the coriander, cumin and cinnamon in a small bowl. In a wide saucepan (see note), heat 1 Tablespoon of the olive oil over medium-low heat. Add the salt-spice mixture, stir well, and cook for 30 seconds. Add the quinoa, stir again, and add 2 cups water. Bring to a boil, reduce to a low simmer, cover, and cook until the quinoa has completely absorbed all the water and the germ has separated from the seed (it looks like a ring), 20-22 minutes. Remove the pot from the heat and fluff the quinoa with a fork. Allow to cool to room temperature. In the meanwhile, combine the black beans, zucchini, tomatoes, corn, peppers, scallions, chopped cilantro, orange and lime juices, garlic, honey, chili paste if using and remaining 3 Tablespoons olive oil in a medium mixing bowl. Add 1/2 teaspoon salt, stir well and let sit while the quinoa cooks and cools, stirring occasionally. 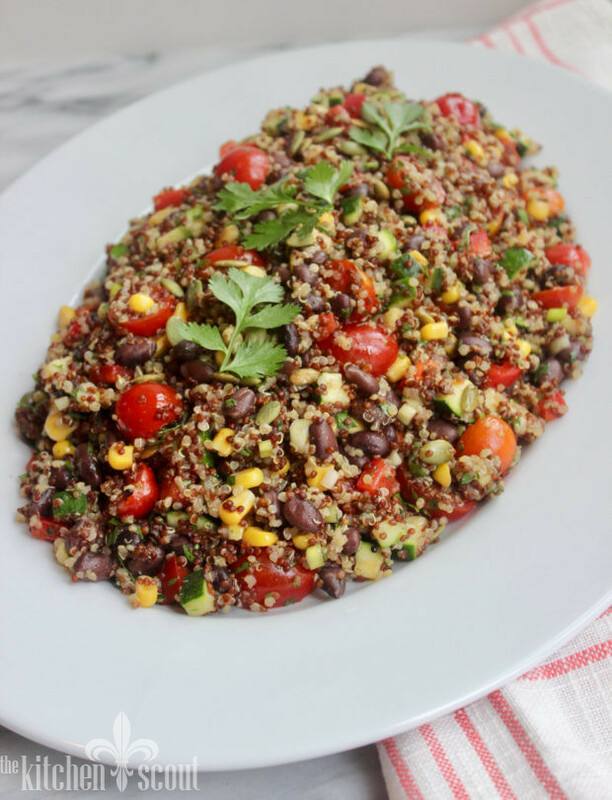 Combine the black bean salad with the cooled quinoa and mix thoroughly. Taste and season. Serve at room temperature, garnished with the pepitas and extra cilantro. Susie's recipe calls for cooking the quinoa in a 3 quart saucepan. I used a wider, more shallow pan which worked very well, allowing the quinoa to cook and the water to completely evaporate in 20 minutes. Another wonderful post Val. I’m sitting here in New York right now, just a block from Kate Spade’s apt. and ever since arriving yesterday, can’t stop thinking about the possible circumstances that would lead such an apparently talented and successful person to feel so desperate. Reminder to to all of us to be kind and compassionate. No one is immune and there is no telling who is suffering deep within.